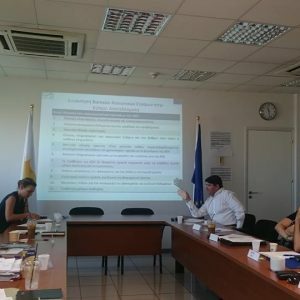 The first of a series of three workshops involving key actors in a participatory process resulting in the determination and ranking of measures to address the impacts of sea level rise was successfully completed today in Nicosia, Cyprus. 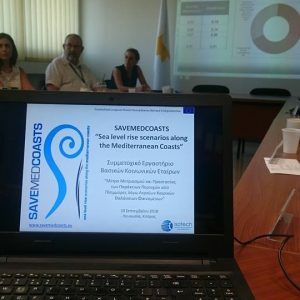 Today’s workshop, implemented by ISOTECH within the framework of the SaveMedCoasts project, was co-organised by the Technical Services of the Ministry of Interior and ISOTECH and involved representatives of key policy-making bodies, including the Ministry of Agriculture, Rural Development and Environment, the Department of Environment, the Cypriot Civil Defense, the Water Development Department, the Meteorology Department, the Public Works Department, the Town Planning and Zoning Department, and the Pafos District Administration. The participants identified the main gaps and needs with regards to sea level rise in Cyprus, and prioritised the necessary actions to address them. A relevant report will be prepared and published in the coming weeks. The next two workshops will take place in Lefkada, Greece later this month, and Rome, Italy in October.